I've been making all those birthday tees for the kids I know and one of my grown-up friends begged me to make one for her upcoming birthday. Unlike the ones I've made for kids, she didn't want her age on it! I thought a little bit about her... she loves to make these giant cupcakes for people's birthdays and she runs a kid's cooking party company where one of her themes is a cupcake bar (she has photos of my boys on her website from Nathan's 6th birthday). 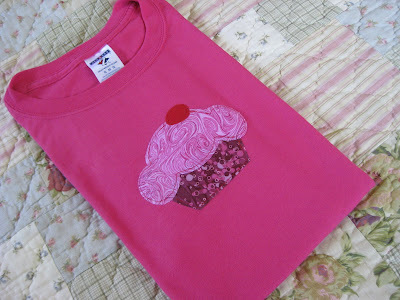 So a big appliqued cupcake tee it was! Ben, my color consultant, chose the color of the tee and the fanciful fabric, and I created the art. I was going to do a birthday candle, but decided a cherry would be more wearable year round. Of course, now my friend wants me to make some aprons with the same design for her and her employees to wear to the parties... So maybe my long neglected sewing machine will be getting some love and affection on a more regular basis! If I can keep the Lego's and art supplies off all the horizontal surfaces around here, that is! I love it!!! Very cute!